We would understand if a Chief Learning Officer who uses a SumTotal LMS in an organization where ADP is the system of record for employee information might wonder why SumTotal can’t automatically connect to ADP. After all, ADP is the world’s largest HR software company. It has been the payroll system of choice for the majority of companies for decades, and many companies use its integrated HRMS. But a few years ago, when large businesses were clamoring for a single unified HR system, ADP developed a complete talent management system, including learning management. At the same time, SumTotal, the workhorse of enterprise learning management systems, developed a talent management suite. 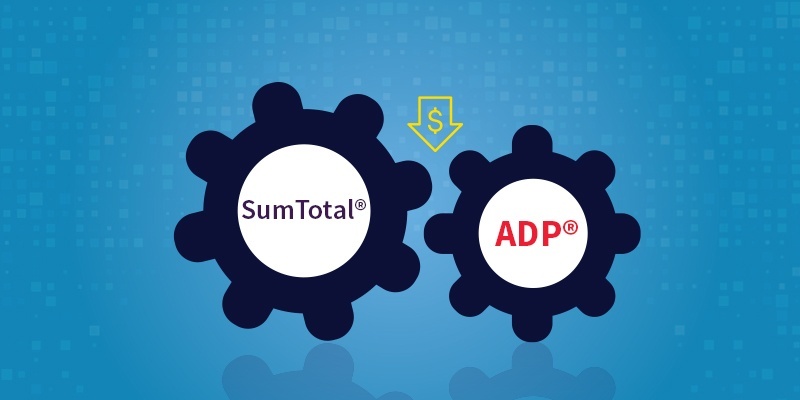 Many businesses use ADP for payroll and SumTotal for learning. ADP is the system of record for employee information, so it becomes a business necessity to use ADP data to manage employee records in SumTotal. Today’s modern enterprise cannot afford to risk data errors or incur the administrative overhead of manual data entry. It’s possible to avoid the cost of developing a data integration using ADP’s API by downloading a report from ADP, manipulating the data in a spreadsheet template, and uploading it to SumTotal. Possible, but certainly not recommended. There is still too much exposure to data error. hire a consultant to do the work. That doesn’t make sense to us. It’s a time-consuming, expensive solution to a common problem. At Chasma, we’ve created a standardized, plug and play connector to use an automated data feed from ADP to SumTotal to manage learner records. You no longer need to develop a custom solution or overburden your already too busy IT group. It only takes a day or so to map the data and deploy the connector, and we give you the tools and support to manage changes when your organization or job structure changes. You can now enjoy the peace of mind of an automated connection without a long deployment or the cost of a custom solution. We have years of experience with both ADP and SumTotal, and we have completed many integrations, but it makes sense to us, in the digital age, to provide a customer-focused solution in the connector that doesn’t require custom work. Enjoy the efficiency of an automated data integration. Contact us to see how our ADP/SumTotal connector can help you manage your employee data.